Mario Contasino was driving up New York’s Fifth Avenue when he struck and almost killed a man we would need badly a few years later: Winston Churchill. The sympathetic driver poked along Fifth Avenue while Churchill tried to recognize Baruch’s apartment building, which he had seen two years before. Nothing looked right. Frustrated, Churchill thought he saw a familiar façade between 76th and 77th streets, paid off the driver, and started to walk north. After a few paces, shortly after 10:30 pm, he apparently changed his mind and decided to take advantage of a momentary break in the traffic (which was two-way in those days). Some things never change: the hospital, a private institution, wished to know how he would pay. With only a few dollars in his pocket, he asked them to telephone the Waldorf. After what seemed an eternity to him, Clementine and his bodyguard Walter Thompson arrived. “They almost got me that time, Thompson,” said Churchill. Clementine paid in cash and chloroform was administered. Churchill was placed in a private room, where Dr. Bloom of the hospital staff cleaned his cuts and treated his sprained shoulder. 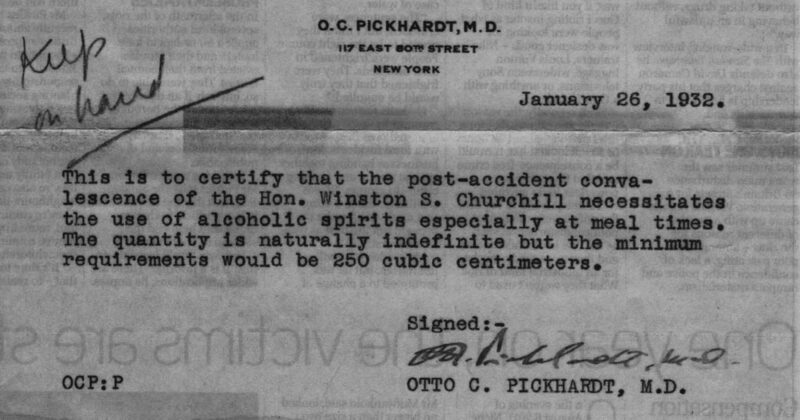 A consulting surgeon, Dr. Otto Pickhardt, was summoned, and Churchill was taken to the operating room for an examination to see that there were no internal injuries. While Churchill was being treated, Mario Contasino was questioned by the police. Based on Churchill’s testimony that he had attempted to cross the avenue against traffic lights and in the middle of the block, Contasino was released and cleared of charges. Churchill later wrote that his intended destination was 1055 Fifth Avenue—which is, in fact, between 86th and 87th Streets, so he’d been ten blocks off. “He took the accident good-humoredly and freely admitted, the police said, that he was entirely to blame,” reported The New York Times. “His greatest concern, hospital official attendants said, was lest the seriousness of his injuries be exaggerated when word of the accident was conveyed to England.”7 His next lecture, scheduled for Brooklyn that evening, was rescheduled, along with other lectures originally intended to run through February 14. The media was intrusive—aren’t they always? After Churchill’s article was published he received a letter of congratulations from the North American Newspaper Alliance, who called his story “a well done job,” and asked for “a photograph of the damage done.” Churchill’s reaction to this impertinent notion is unrecorded. 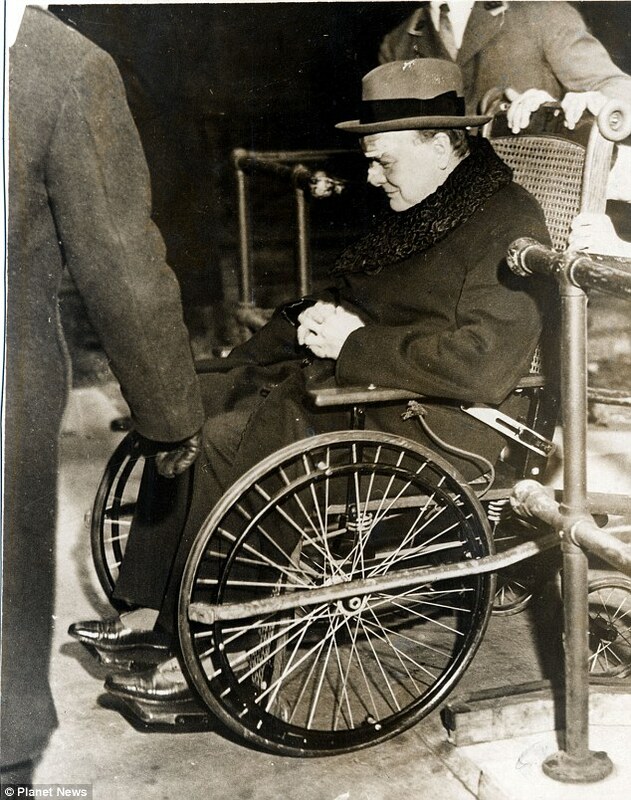 On the 21st, a day after Contasino’s visit, Churchill was discharged, transferred by wheelchair and automobile to the Waldorf Astoria, wearing a large dressing across the bridge of his nose. He was accompanied by Clementine, Diana and Dr. Pickhardt, who said he’d have to remain in bed and recuperate for two weeks. Mario died aged 83 in 1989, but interest in him revived some seventy-seven years after the incident. In January 2008 Codemasters, a British video game producer, launched a game, “Turning Point: Fall of Liberty,” with a counterfactual scenario in which Churchill’s accident proves fatal. Inspired by the actual facts, Codemasters set out to honor Contasino through his descendants. Edward F. Cantasano (November 25, 1905 – January 17, 1989) also known as Mario Contasino, was an unemployed mechanic from Yonkers who, on December 13, 1931, accidentally hit the future Prime Minister of the United Kingdom, Winston Churchill, while driving a car. Featured Image: The original illustration from The Daily News portrayed Contasino’s car as a taxi, giving rise to a long-running inaccuracy; it was in fact a private car. 1 Martin Gilbert, Winston S. Churchill, vol. 5, The Prophet of Truth 1922-1939 (Hillsdale, Mich.: Hillsdale College Press, 2009), 421. 2 William Manchester, The Last Lion, Winston Spencer Churchill, vol. 1, Visions of Glory 1874-1932 (Boston: Little, Brown and Company, 1983), 877. 3 Roy Jenkins, Churchill: A Biography (New York: Plume, 2002), 443. 4 Winston S. Churchill, “My New York Misadventure,” in the Daily Mail, 4-5 January 1931, republished in The Collected Essays of Sir Winston Churchill, 4 vols. (London: Library of Imperial History, 1975), IV 90–91. 5 Manchester, Visions of Glory, 877. 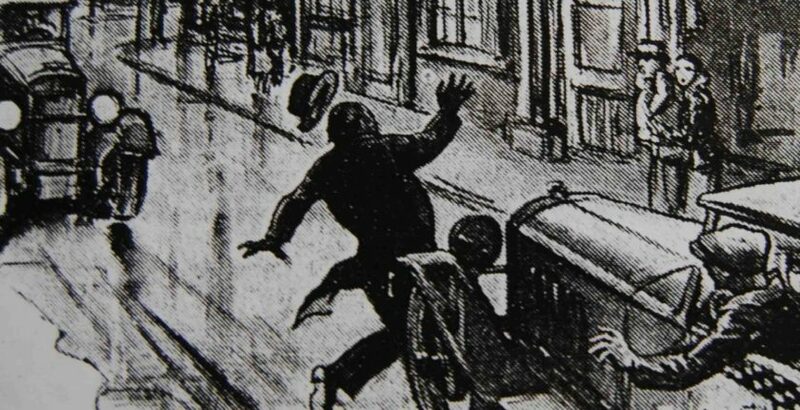 6 Details of the Lenox Hill reception are from “Churchill Injured by Auto in 5th Av. : British Statesman’s Shoulder Sprained and Face Cut as He is Struck at 76th Street,” in The New York Times, 14 December 1931, 1. 10 “Winston Churchill Develops Pleurisy Following Injury by Auto in 5th Avenue,” The New York Times, 15 December 1931, 1. 11 Manchester, Visions of Glory, 879. 12 “Churchill Greets Driver Who Hit Him,” The New York Times, 21 December 1931, 23. 14 Gilbert, Prophet of Truth, 421, n. 1. 16 Yonkers Statesman, 21 December 1931, 7. 17 Arthur M. Schlesinger, Jr., “History’s Impresario,” speech to the International Churchill Society, Boston, 28 October 1995, in Churchill Proceedings 1994-1995 (Hopkinton, N.H.: Churchill Center, 1998), 90-91. 18 Churchill, “My New York Misadventure,” in The Collected Essays of Sir Winston Churchill, IV 94.